Stand by for Action! Anything Can Happen in the Next Half Hour! These exciting words opened each episode of the children�s television series Stingray, a creation of British television producer Gerry Anderson which began airing in 1964. One of the first British shows to be filmed in colour, the series featured caricatured puppet actors that incorporated the studio�s unique Supermarionation process of synching pre-recorded dialog with electronic lip movement. Operating the puppets in this manner allowed the puppeteers to focus on each character�s body movement and eliminated the distracting �head bob� that usually plagued marionettes with string operated mouths. Weekly episodes chronicled the futuristic underwater exploits of Captain Troy Tempest, his second in command �Phones� Sheridan and their companion �Marina�, a sort of speech-challenged, mermaid-like underwater beauty. The trio was often pitted against underwater nemesis Titan and his bumbling surface agent, X20 but the real star of the show was the title craft. Cleverly designed by Reg Hill to incorporate many fish-like visual cues, the Stingray miniature was brought to life by a special effects crew that featured Derek Meddings and Brian Johnson, both of whom went on to have very successful SPFX careers in the film industry. Following the successful marketing pattern of Anderson�s earlier shows Fireball XL5 and Supercar, Stingray was heavily merchandized with an array of licensed toys and print material. The toy featured in this article is one of the best representations of the submarine in terms of both play value and also for effectively reflecting the on-screen contour of the vehicle. Toy Description The Remote Control Stingray by Lincoln International is a 12.5� battery operated toy, controlled via a hand held unit which is attached to the submarine by a cable. Although not truly �remote control� by today�s standards, the control unit can command the submarine to move forward or reverse while the propeller, (Ratemaster Jet Propulsion Tube) rotates. The interior lights can be switched on and off and an �Azdic Buzzer�, (horn) can be triggered. The control unit also features a whistle and holds the batteries. The upper and lower hull halves are held together with 5 slot-head screws and it is the pressure created from tightening these screws that holds the Midship Stabilizer Fins and Tail Hydroplane Fins in place as the hull presses together. Packaging The toy was merchandized in a colourful, 2-part box. The outer card sleeve featured colour renderings of the submarine augmented with series logos, graphics and bold text describing some of the features and abilities of the toy. The inner box was formed from corrugated cardboard with 4 die-cut inserts to cradle the toy during transport. A small decal sheet with hull graphics for �Stingray� and the number �3� was included, but an unfortunate printing error coloured the number �3� in black instead of white, rendering it invisible on the dark blue cabin fins. A product guarantee and very basic instruction sheet complete the toy. 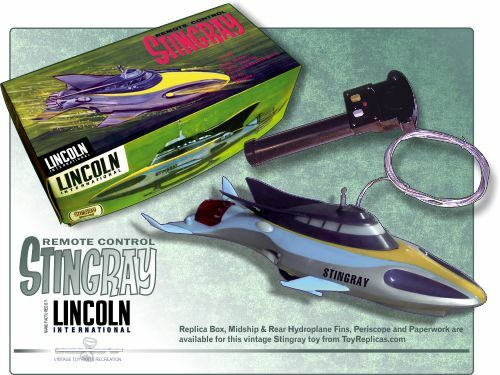 Variations The Lincoln International representation of Stingray shares virtually the same molds as the friction drive toy manufactured by Lakeside Toys. Released in 1965, both versions were sold in a colourful, display box which detailed the attributes of each toy. Though identical in size and upper hull contour, there are some notable molding differences on the lower hull to accommodate either the 3-wheeled battery operated version by Lincoln or its Lakeside 4-wheeled friction-drive counterpart. The Lincoln Stingray sports a red �Ratemaster Jet Propulsion Tube�, and an overall silver plastic hull and periscope, while the Lakeside model�s Ratemaster is molded transparent around a red/green spiral insert with a blue upper hull and yellow lower hull & periscope. However, the plastic midship fins and rear hydroplane fins are identical and interchangeable between the two toys. Although Stingray followed the successful formula of the Supermarionation shows before it, the series is not quite as memorable in the baby-boomer consciousness as perhaps Supercar or Fireball. However, the series still created its own fan base and merchandise based on the show is highly sought after by adult collectors to this day. Additionally, the studio�s SFX crew and puppeteers made many innovative advances in filming techniques during its creation which paved the way for Anderson�s most famous television masterpiece � Thunderbirds.